Written by: Karen on July 19, 2015. Following on from Iron-man, The Hulk and the rest the Avengers, another Marvel creation makes the leap from comic to screen. Or, in the case of Ant-Man, several mighty leaps and an ant-ride or two. As with most origin stories, there’s a good deal of back-story and character-building to do in the first part of the film. 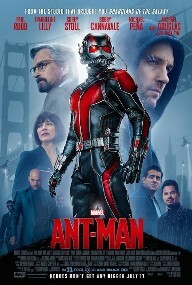 We meet the story’s unlikely hero, Scott Lang (Paul Rudd) as he leaves San Quentin jail, where he’s served three years for robbery. Though he vows to go straight for the sake of his small daughter (Abby Ryder Fortson), his criminal record sees him fired from his first job, and Lang agrees to help his ex-cellmate Luis (Michael Pena) with ‘one last heist’. All he finds in the safe is what appears to be a motorcycle suit and helmet – but when trying them for size back at Luis’ place, Lang discovers that there’s more to this piece of kit than meets the eye. The suit’s owner is Dr Hank Pym (Michael Douglas), a scientist who discovered the size-changing ‘Pym Particle’ back in the 1980s, but refused to share its secret when he realised that it would be used for warfare. Now, Pym’s protégé, Darren Cross (Corey Stoll) is on the verge of making the same breakthrough, and he doesn’t share Pym’s scruples. Pym has a plan to prevent Cross selling the secret – and for that, he needs Lang to become ‘Ant-Man’. Pym also has a daughter, Hope (Evangeline Lilly), whose relationship with her father is so fragile that Cross believes she’s happy to betray him and work for Cross instead. It’s the father-daughter relationships, and their journeys to understanding and redemption, that elevate the film above the routine ‘good-guys-versus-bad-guys’ plot. The humour is sometimes forced – and the late-blossoming romance certainly is – but there are a number of laugh-out-loud moments as Lang learns to use the suit properly and, later, in a last-battle scene that cleverly echoes previous superhero fights while adding unexpected and unique twists. Director Peyton Reed (a replacement for Edgar Wright who left the production citing ‘creative differences) keeps everything moving slickly, and does a great job with the transitions from SFX to live action. The effects are fantastic – but they are there to illustrate and support the action, not drive it. It’s the characters who move the film forward, and the actors all bring a belief to their roles that helps the audience buy into shrinking people and an army of ants under human control. From a (necessarily) slow start, it builds to a fun-packed action ride, with nods not only to other movies from the Marvel franchise, but to classic films such as North by Northwest too. Will there be a sequel? Make sure you stay right to the end of the credits to see a hint of what’s to come.